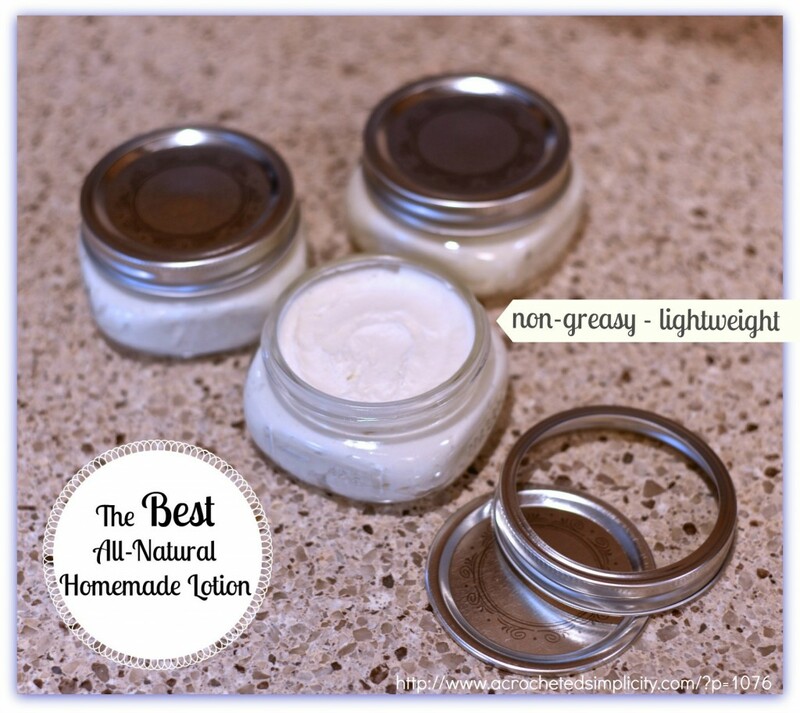 DIY | The BEST All-Natural Homemade Lotion ~ Non-Greasy, Lightweight & Perfect for year round use! Have you ever heard the phrase “Necessity is the mother of invention”? As with most things I’ve created, this recipe for The Best All-Natural Homemade Lotion is no exception. As young as a pre-teen, I can remember choosing my lotions based on scent alone. This carried into my teens and twenties and as the popularity of big chains grew so did my collection of scented lotions… lotions that I slathered all over my body, from head to toe, because “they smelled soooo good”. Did I ever think to read the back of the bottles to see exactly what I was forcing into the largest organ of my body….my skin? Oh heck no! I chose based on scent. I wanted to smell good. I wanted to feel good. After all, if we smell good, we feel better about ourselves, right? We may, but does our body feel better? Approximately 4 years ago, I began to develop psoriasis. Just little spots on my elbows and knees. Not too bothersome, but there. I would use a dab of a steroid cream prescribed by my doctor (again not thinking about what exactly I was putting on my body) and the little spots would go away for a while. Then 2 years ago, my psoriasis came back and this time it was more persistent and spreading. A couple more trips to the doctor, a couple blood tests to check for underlying causes, more prescriptions and still not much relief ultimately led me to the creation of this lotion. This is when my journey to make all-natural body products began. I started on Pinterest by searching for homemade lotion. The results were overwhelming, but I chose a couple, ordered all of the ingredients suggested and off I went! While the lotions I made were okay, there was something about each of them that I didn’t like… many were greasy (I had to wash my hands after applying), some were super thick and had to be spooned out of the jar and held in my hands for a minute before they were soft enough to spread over my body, and others weren’t all-natural… they called for the use of that smelly pink baby lotion that my mom slathered all over me as an infant! Eventually, I learned enough about the different ingredients I had been using and began to experiment on my own. Then one day this past summer, it happened! I had finally made The BEST All-Natural Homemade Lotion!!! I was SO excited that I made some for friends and family (to make sure I could duplicate it) and they all loved it! It’s non-greasy (you don’t have to wash your hands after applying), lightweight (great for all year round…even summer), leaves your skin softer than a baby’s bottom, has a nice soft texture, spreads evenly, soaks in almost immediately (there’s no need to wait to get dressed), and the best part? It’s great for your health!!! 😀 It even helps to keep my psoriasis under control…it’s no longer noticeable to others! So without further ado, let’s make The BEST All-Natural Homemade Lotion and nourish the largest organ on your body! *These items can be purchased through our affiliates by clicking the links below. 1/4 cup Aloe Gel – 100% Pure Gel (substituting with aloe juice will greatly affect the consistency of your lotion): Art Naturals Aloe Vera Gel – Certified Organic, 100% Pure Natural **Note: if you choose to purchase a different aloe vera gel, make sure it DOES NOT have the ingredient Triethanolamine in it. It has been proven to cause many health issues. Add approximately 1 inch of water to your pan and put your bowl on top of your pan. *Make sure your bowl is a tad bigger than your pan so that the bottom of the bowl doesn’t touch the bottom of the pan. Add the Coconut Oil & Beeswax Pellets to your bowl and melt over medium heat. *Coconut oil has a much lower melting point than beeswax, so expect the beeswax to take a little longer to fully melt. Add the Shea Butter once the beeswax has fully melted. *The shea butter is added after the coconut oil & beeswax because it doesn’t like to be heated for too long. Once the shea butter has melted, stir to make sure it’s all mixed well. Remove from heat and put it in the fridge for 20 minutes. *Doing so brings the temp down closer to the room temp oils you’ll be adding next and allows them to blend easier. 5. In a separate glass bowl, mix together the Almond Oil, Aloe Gel, Red Raspberry Seed Oil, Carrot Seed Oil & approximately 48 drops of Essential Oils of choice. 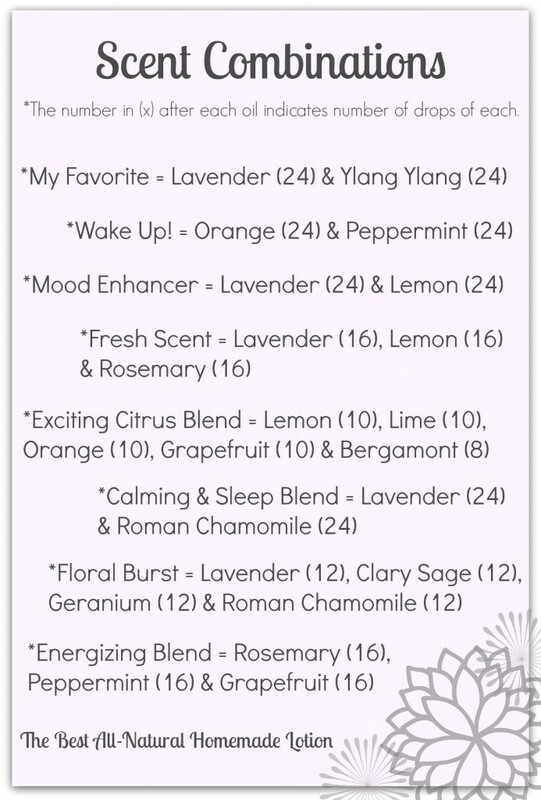 *See Below for scent blends to try. 7. Using a hand mixer, mix on low for 30-45 seconds to even out the consistency again. Pop the mixture back into the freezer for another 5 minutes. 10. Fill your jars! Let the lotion sit on the counter for a while to finish setting up. Of course you can use it right away, but I prefer to wait. *A little goes a long way! An amount the size of an almond is enough for both of my arms. If you find yourself feeling a little greasy the first time you use your lotion, you’ve probably used a little too much. *Optional: I like to use these neat wooden tags to label my jars. They add a nice touch when giving as gifts. I use a scrap piece of yarn to attach them. 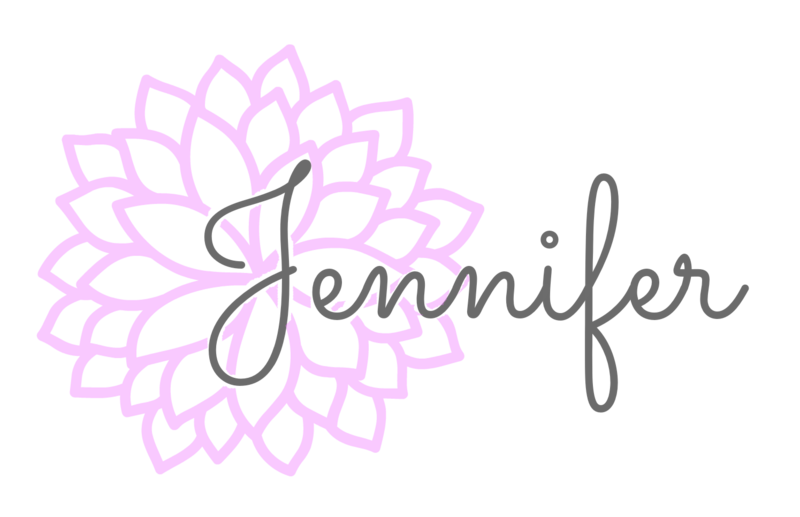 Let’s Talk Scents & Essential Oils! I prefer to add 48 drops total of my essential oil blends for a lighter overall scent (I use clinical grade oils). You can add more or less to suit your personal taste, but I believe this is a good starting point. *If you’re sensitive to fragrance, I recommend starting with even less. Clinical Grade versus Therapeutic Grade EO’s: Not all essential oils are created equally, but I’m not here to suggest which oils you should use. Definitely use the oils you trust and prefer. I just want to point out that the grade of the oil can affect the number of drops you need to add to achieve your desired scent strength. I’ve found that most therapeutic grade oils only contain 40% pure essential oil, where most clinical grade oils are 100% pure. So depending on which you choose to use, you may need to use more or less to obtain your desired scent strength. **NEW: Hormone Balancing Combination for Women: 30 drops Clary Sage, 30 drops Thyme & 30 drops Ylang Ylang. This is a blend that I use and I love it! Check out Dr. Axe for great information on balancing hormones naturally! The Best All-Natural Homemade Lotion. Non-Greasy, Lightweight & Perfect for year round use. Melt coconut oil and beeswax pellets in a double boiler. Add shea butter to coconut oil and beeswax and heat until shea butter has melted. Put oil mixture in the fridge for 20 minutes. In a separate glass bowl, mix together the Almond Oil, Aloe Gel, Red Raspberry Seed Oil, Carrot Seed Oil & approximately 48 drops of Essential Oils of choice. Mix coconut oil mixture with almond oil mixture. Put in the freezer for 15 - 20 minutes. Using a hand mixer, mix on low for 30-45 seconds to even out the consistency again. Pop the mixture back into the freezer for another 5 minutes. When you pull your mixture out of the freezer for the last time it should still be very liquidy, just a little lighter in color than when you put it in this last time. Fill your jars! Let it sit on the counter for a while to finish setting up. Of course you can use it right away, but I prefer waiting. *A little goes a long way! An amount the size of an almond is enough for both of my arms. If you find yourself feeling a little greasy the first time you use your lotion, you've probably used a little too much. How much do I need to use? A little goes a long way with this one! I use approximately the size of an almond for both arms. If you find yourself feeling a touch greasy, try using less next time as you shouldn’t feel greasy at all…just super soft! What is the shelf life of this lotion? I am not 100% sure, but it’s at least 3+ months as this is how long I’ve had a partial jar sitting on my bathroom counter. I’m sure it’s much longer. Do I have to use glass jars? I strongly suggest you do because the oils in the lotion would cause plastic containers to start breaking down and leaching chemicals in to your all-natural lotion. How do I store it? I store mine on the counter in my bathroom, out of direct sunlight. If your home gets extremely warm in the summer, you will find your lotion will become very thin. You can store it in the fridge, if desired. What is the SPF of this lotion? I have not tested this lotion for SPF, but plan to next summer. This post contains affiliate ads. I just wanted to thank you for sharing your experiences and recipe. I am looking forward to trying it! I’ve just started experimenting with home-made lotions and have struggled to find one that works well for me. This one looks really promising and I’m looking forward to trying it once I receive my order of carrot seed and raspberry seed oils! I’m just wondering about preservation – I’ve been reading a lot on the internet that anything that has a water-like base (from my understanding aloe gel counts as this) needs a preservative to keep it safe beyond a few days? Are one of the ingredients in this list a natural preservative? Or is this preservative-free? In that case, how long does the product last? Hi Sara, Here’s an article regarding natural preservatives. There are several things you can use (including some of the essential oils you choose) to help preserve the shelf life of your lotions. http://www.fromnaturewithlove.com/library/preservatives.asp Lots of great info there that you can incorporate into your lotion. I typically use mine up rather quickly, make sure to store it in a dark cupboard, use small bamboo spatulas (found on Amazon) to scoop lotion out and I use different essential oils that help preserve and I’ll also add T-50 Vitamin E Oil. I hope this info helps you on your way to finding something that works great for you! Thank you so much for the recipe! I can’t wait to try it out. All the other recipes were always too greasy, that’s why I’m so excited for this one! I have a question though, can I substitute shea butter with cocoa butter, or mix like half half? Or will that change the consistency? Thank you! Hi, I absolutely love your recipe, however, I must did something wrong or use the wrong oil, I am allergic to coconut oil, so I used a mixture of evening primrose oil, jojoba oil and borage oil to substitute the coconut oil. And I used homemade aloe vera gel from my own plant. The “cream” was okay up to method 8, magic didn’t happened and the ‘mixture’ didn’t turn into a cream, it ended up as a greenish colour lotion…..><…. Can you tell me what did I do wrong? Still, the lotion does give me a super soft skin…. I am suffering from severe eczema, have been searching for a non greasy recipe, yours one seems perfect, well, if I can get it to become a cream…. If it is too liquidy, you could always add a little more beeswax to help it set up more. Do you use this on your face? I do! But it takes very little. Is it just me or does unrefined shea butter have an extremely strong, not necessarily pleasant, smell to it? I just bought it a few months ago from mountain rose herbs and its been stored in the fridge so I know it’s not rancid. But wow! It is so strong! Question, Do you use this on your face? I’m looking for a diy cream or lotion that I can use on my face. All the ones i’ve made thus far have been too greasy. What brand of essential oils do you use? I use Ameo Oils. They’re 100% pure clinical grade oils. I’m really excited to try this!! Like everyone else has said, all other homemade lotions are overly greasy. I was wondering that if i can’t get carrot seed oil and the red raspberry seed oil, is there something else I can replace it with or maybe even just take it out of the recipe? Would it change the greasiness of the lotion when finished? Thank you very much indeed for sharing this recipe -seems promising for a good consistency cream. I wonder if I could possibly use grape seed oil instead of the raspberry and carrot seed oil? I live in country where it is very difficult to get hold of the above -however I do have a bottle of good quality organic grape seed oil. Hi Betti~ You could definitely give it a try. I only added the raspberry and carrot seed oils to help with a SPF factor in the lotion and the amounts are minimal so I doubt you’d notice a big difference in texture.